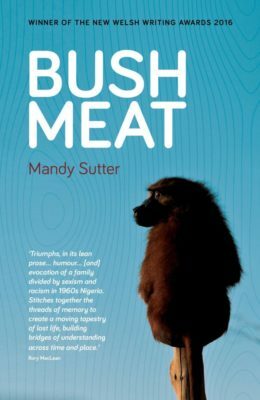 BUSH MEAT by Mandy Sutter (New Welsh Rarebyte), winner of the New Welsh Writing Awards 2016: University of South Wales Prize for Travel Writing, will be published on 15 October 2017. Available in print via the Gwales website and bookshops (£10.99) and Kindle e-book (£8.99), it is also available to order in print and e-book. Bush Meat is inspired by the author’s childhood experiences in early 60s Nigeria, and unifies black, white, indigenous & expat experiences across continents and three generations. Sutter is also the author of chicklit Stretching It and the popular Reluctant Gardener blog. Bush Meat is Sutter’s first literary novel. There will be a series of launch events, beginning with an Ilkley Literature Festival launch on 15 October, and ending on 30 November in the Grove Bookshop, Ilkley. See newwelshreview.com/rarebyte.php for more information on tickets.